This entry was posted in Mental Health and tagged Eating Disorder, Professional Help, Signs and Symptoms on September 19, 2016 by Team Addiction Hope. When hearing the phrase “eating disorder,” most people think of anorexia and bulimia (officially known as anorexia nervosa and bulimia nervosa). These are common, but they are far from the only types of eating disorders. If you or a loved one has an eating disorder, it might be difficult to pin down exactly what it is. Knowing the types of eating disorders, as well as their signs and symptoms, can help you and your support network understand what you are facing. This will help you or your loved one recover more quickly and get lasting results. According to the National Association of Anorexia Nervosa and Associated Disorders, 8 million Americans suffer from anorexia nervosa and/or bulimia nervosa. The stereotype of these disorders is that they only affect females. Although millions of girls and women suffer from anorexia or bulimia, at least 1 million males do too. Four out of 10 people of both genders have had an eating disorder or know someone who does. Additionally, 2.7 percent of both male and female teens between the ages of 13 and 18 suffer from an eating disorder. Anorexics may reject formerly favorite foods. They might weigh themselves constantly, exercise compulsively or do anything they can to avoid sitting still. With bulimia nervosa, self-starvation is exchanged for binging and purging. Bulimics will go on binges of all food types and often report feeling out of control during an episode. It’s not uncommon to see a bulimic person binging on food items like huge sandwiches, an entire pan of brownies or heavy amounts of soda. After an eating binge, a bulimic will purge. Vomiting is a common way to purge, but many bulimics abuse laxatives, diuretics and diet pills to get rid of food and calories. Like anorexics, bulimics may exercise compulsively and express excessive concern about weight. Some bulimics may fast to get results, but this is not considered self-starvation. Many people with eating disorders fly under the radar because their behavior isn’t recognized as a specific disorder. These individuals eat three meals a day but are extreme in the way they relate to their bodies and food. They are said to have eating disorders not otherwise specified (EDNOS). EDNOS sufferers do not meet enough criteria for a diagnosis of anorexia or bulimia. For example, a female with EDNOS could meet all the criteria for anorexia, except she has a normal menstrual cycle. A man with EDNOS could meet all the requirements for bulimia, except he does not binge and purge more than twice a week, or has not binged and purged for more than three months. These specifics make EDNOS more difficult to diagnose and treat. However, EDNOS must be addressed because, just like its “classic” counterparts, it can lead to death. Binge eating or compulsive overeating: Now recognized as a disorder of its own, binge eating (compulsive overeating) involves uncontrolled continuous eating, sometimes to the point where the eater is painfully full. Binge eaters do not purge, but they may engage in fasting or periodic, repetitive diets out of shame or guilt. Binge eating often contributes to obesity and, like other eating disorders, has a deep psychological component. Pica: This is a medical condition that involves cravings for non-nutritive substances. Common substances include rocks, dirt or paper, but pica can involve almost any nonfood substance. Some women experience pica during pregnancy and must seek treatment. However, if pica symptoms do not disappear postpartum, then it may be a legitimate eating disorder. 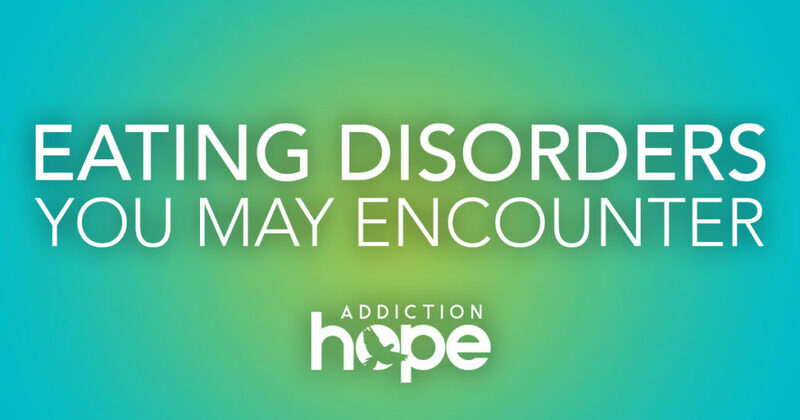 If you or a loved has an eating disorder, help is available. More than likely, you will have therapists and treatment programs to choose from in your area. The right treatment could help you learn to see food as a friend again.